Fit Fluential Mom: Honey, Pollen and How they Can Cure Your Allergies! 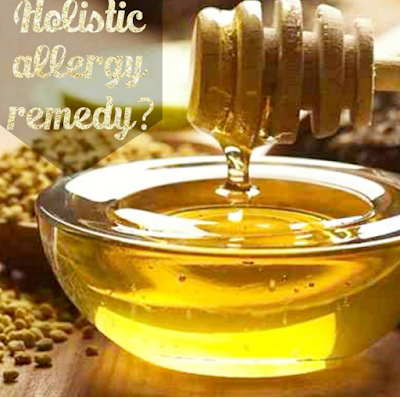 Honey, Pollen and How they Can Cure Your Allergies! Spring is here and that means....so are some raging allergies for many! Since my daughter was 2, her allergies have been awful and my husband has a problem with them as well. Being a holistic mama, I am not a big fan of medications, allergy shots and other remedies that have even been known to include steroids. If I can find a holistic solution, I will and I have with honey and bee pollen. A friend told me about honey therapy a few months ago and it has intrigued me ever since. I had been giving my daughter honey regularly if she had a cough or sore throat but what I wasn't doing it was giving it daily AND giving her LOCAL honey! I also wasn't including the pollen, which I wasn't even aware was something we could consume! So....Why does it have to be local honey and local pollen? The answer is SIMPLE! Because local honey and pollen help you develop immunity to the local allergens in your area. They serve much like an allergy shot but without the nasty chemicals that come with shots, the pain and it tastes better too :) An all around WIN WIN for my kids and for this holistic mama! We introduced local honey and bee pollen about 2 months ago. I was willing to try anything after an allergy flare up led to an asthma flare up and ended up landing my 7 year old in the ER for the first time ever. They sent us home with 4 doses of prednisone, albuterol every 4 hours PLUS claritin every single day for her allergies and asthma. If you're not aware of prednisone and albuterol...they're steroids and over my dead body was I going to give all of that to my baby. So I researched the heck out of honey therapy and that weekend we went to our local honey farm, Benett's Honey Farm, and bought tons of honey and bee pollen. We started giving it to her every single morning from then on. She loves honey and didn't mind the pollen taste so she had it off a spoon combined. I put the pollen on a spoon then pour honey over it. She has had it every single day since we bought it and she no longer has an issue with a 24/7 runny nose! That has been her since she was 2 years old. She was so used to always having a runny nose that she didn't even notice it was running anymore. The last few days it's been super windy and allergens have been very high but she really hasn't had any trouble at all, hasn't needed her allergy pill and hasn't complained at all about her nose running. The rest of us, my husband, 2 year old son and I, have it in our Shakeology each day because we're not as big of fans of the pollen taste but it's just as beneficial either way. I'm a firm believer in holistic remedies and I can honestly say, honey therapy has worked for my angel! Since then we have also begun using essential oils to treat her allergies towards pets, dander and coughing in the evenings as a result of asthma so stay tuned for my holistic remedy blog post for that! For those that want more "book" type of information on honey and pollen, here's a little background too! What's the story with honey and pollen? In children over over a year old, local honey has often been used as a holistic remedy for things such as sore throat, coughs and battling seasonal allergies. Does it live up to its reputation? That all depends on how much you rely on scientific studies, mostly funded by pharmaceutical companies who rely on profits from their medications. "No study has ever conclusively investigated honey to my knowledge, but anecdotal evidence supports an inherent logic to why local honey might prove very effective. When bees pollinate flowers, some of the pollen remains on their legs, ultimately making its way into the honey we eat. The result for us is much like homeopathy, immune response therapy, or even the theory behind vaccinations (but that's a whole other Oprah I won't go into here....). When a very small amount or ‘dummy’ version of pollen or other substance (such as a virus in the case of vaccines) is introduced to the body, the body produces antibodies to respond to it. When a larger quantity is introduced, the body is ready. Make sense? Honey is your ready-made homeopathic dose of pollen. Either offer it to your child by the teaspoon, or mix it into tea, a smoothie, yogurt, oatmeal, etc. Mine love to eat it right off the spoon since it's so sweet and our local honey farm makes flavored local honey in wildflower, orange and eucalyptus varieties which make them even yummier! 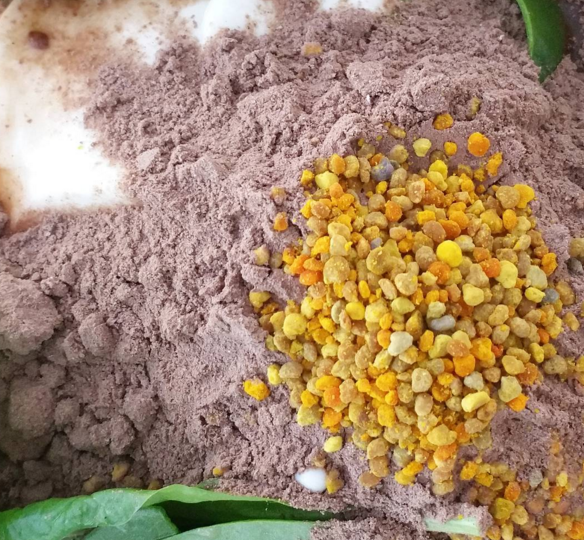 When you add pollen to the mix, you're just fortifying the effects of honey with another dose of goodness. Bee pollen is the food of the young bee and it is approximately 40% protein. It is considered one of nature's most completely nourishing foods. It contains nearly all nutrients required by humans. About half of its protein is in the form of free amino acids that are ready to be used directly by the body. It really can't get much better than this when it comes to a super food so, if your child or you are not allergic, it's a great supplement to add to your diet. Introducing pollen and honey should be done in SMALL amounts at first to observe for allergies to it. Many are allergic to pollen and are unable to consume it. Some are just mildly allergic and can have it in very small doses. It's important to monitor yourself and/or your children when introducing honey and pollen at first to be aware of any changes. If you have any questions, feel free to shoot me an email at info@fitfluentialmom.com, find me on Facebook and on Instagram as well! I share many holistic remedies, clean recipes, workout tips and more! Excellent post! i like your blog. Keep sharing.